Do You Want To Inject A Little Creativity into Your Family Life? 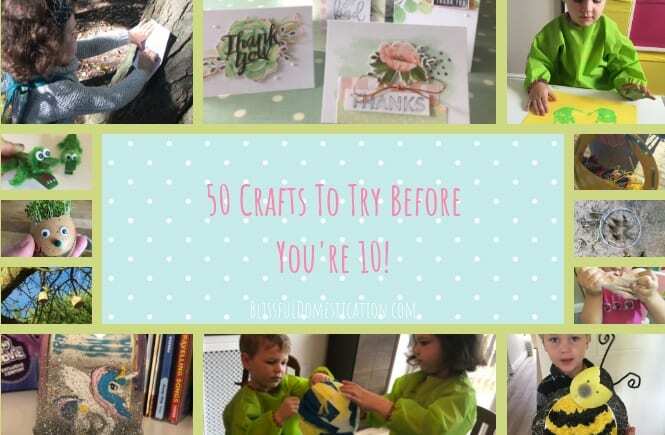 I have created a list of 50 Crafts To Try Before You’re 10! It was created with children and family’s in mind, but can also be for adults too. It’s a resource of ideas and inspiration for crafts projects, suitable for children (and adults) of all ages, and means you will never be short of an idea or two! From painting to textiles; papercrafts to modelling and mixed media to nature inspired crafts; there is something on there to suit everyone! Inspired by the National Trust’s 50 thing’s to do before you’re 11 3/4, which largely focuses on outdoor activities, this is a simple checklist which allows you to introduce and include creative activities into every day family life. Arts and craft activities are hugely beneficial to children’s development. They can help with the development of fine motor skills, problem solving skills and general brain development. Exposing kids to numerous creative processes and different media can also help children express themselves, inspire their imagination and build their confidence. I came up with this list of 50 Crafts to Try Before You’re 10! initially for our family. I wanted a check list to make sure I was exposing our children to all sorts of different crafts and not just the ones I was familiar with. I have done quite a few of these activities already with the kids, but others I’ve not tried since I was a child myself, and several I’ve never tried before. If you would like to follow along our journey to complete all 50 crafts, and for our weekly newsletter pop your e-mail in below. 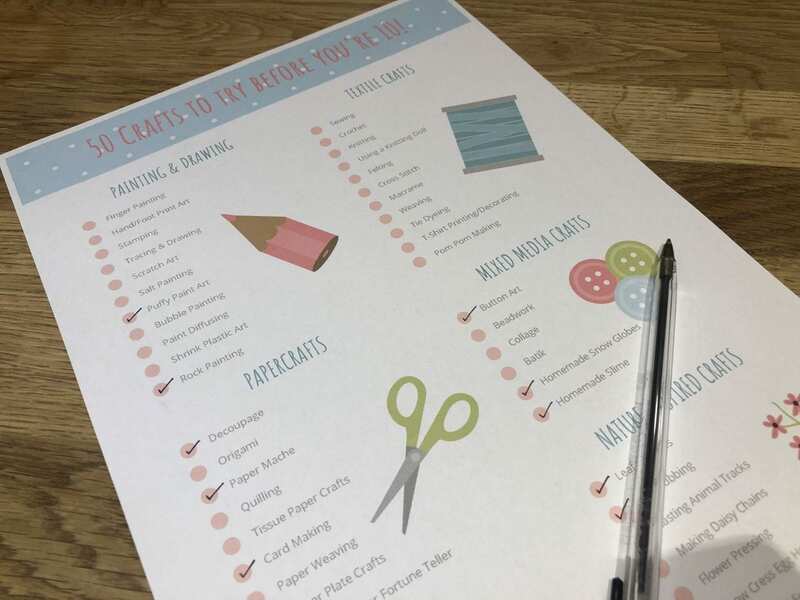 As a thank you gift for signing up to my mailing list, you will receive a FREE printable checklist of all 50 crafts so you can keep track of what you’ve completed so far. Great for the kids to engage with, and encourage them to want to learn new skills. If you do complete one of the crafts, don’t forget to post a pic on social media and use the hashtag #50CraftstoTry. Hopefully we will get a nice little community together that are following along. Want to Follow Us Along Our Craft Journey? You will be sent our weekly newsletter, and occasionally emails about updates, our products and other products that we love, and may be affliated to. To make sure you get to join the journey, don’t forget to hit the confirm button on the email I just sent you!